Sauté chopped onion and minced garlic in preferred healthy cooking oil over medium heat until tender. Add tomatoes and green chilies. Reduce heat and cook uncovered for 6 to 8 minutes or until thickened. Stir in beans and remaining ingredients. Cover and heat 5minutes more. Freeze leftovers for days 16-18. 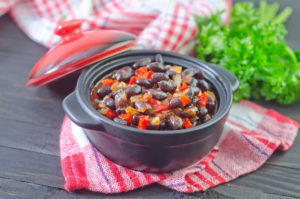 Enjoy the Spicy Black Beans and Tomatoes!